There are so many fun new products! Be sure to check out all the lovely inspiration from our Artzy Designers!! You should have arrived here from the amazing and talented, Chris’s blog! If you haven’t and would like to hop along with us, please go back to the Dare 2B Artzy Blog to start at the beginning! Blog Hop will end Saturday, August 18th at 7:00pm Central. Hi Everyone! I hope you are enjoying the Dare 2B Artzy New Product HOP today! Are you in love with all the new goodies? I am!! They’re all awesome so it’s hard to choose. I want them all!! I was lucky enough to get to play with the new adorable Squirrel stamp set! I just love all of the Dare 2B Artzy critters. They are so cute! I colored the squirrel couple with my Copic markers with various shades of brown and added a touch of blue and pink to her flower and bow. Once I was finished coloring them I fussy cut them and set them aside. 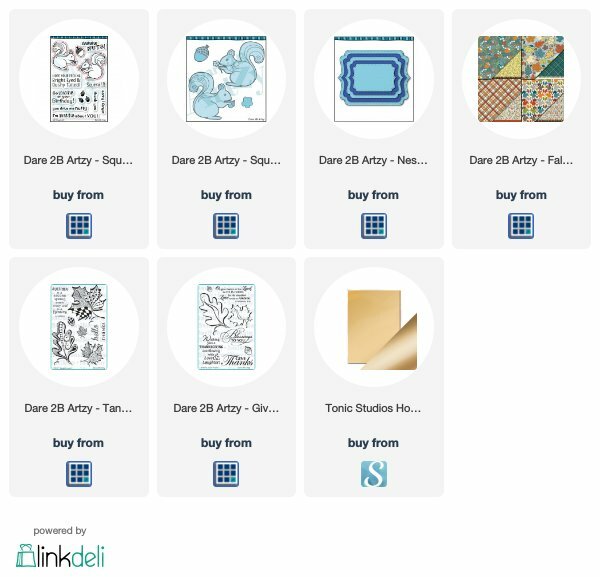 The new release features some amazing new 12×12 scrapbook papers that are stunning! My favorite is the Fall Harvest Collection because the large leaves coordinate perfectly with the Fall Leaves dies. I LOVE THAT!! Dare 2B Artzy has made creating cute cards and projects so seamless with the coordinating stamps, dies and papers. The dies cut the leaves beautifully with no visible lines around the outer edges. I used the coordinating dies to cut out several of the colored and patterned leaves from the Fall Harvest leaves paper in various sizes. I also cut some of the smaller leaves using the same dies and some matte gold cardstock. To assemble my card, I paired up a piece of the plaid cardstock that I’d cut the edge off of with a wavy die. I also cut some of the other fall cardstock using the new Nesting Rectangle Fancy Frames and finally I cut a circle from some more matte gold cardstock. I was able to layer up each element on my card using some dimensional foam. On the inside of my card I used the I’m Nuts about You sentiment. The squirrels are so Stinkin Cute!! WAIT– that’s the secret discount code!! Be sure to use StinkinCute when you shop over on Dare 2B Artzy from today through 8/31/18 to enjoy 10% off of your order!! What a great deal! 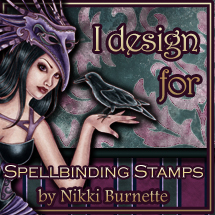 You can get all of your favorite new release stamps, dies and papers AND get them at a discount! Be sure to stop and leave some love to all of the Design Team members for your chance to win a prize!! Your next stop in the hop is Karen’s blog! Beautiful! I love those little squirrels! Thank you very much Avra! You’re too kind! Your coloring is amazing love the design of your card too! Thanks so much Pam! Appreciate it! Aren’t the Dare 2B Artzy squirrels just adorable! I love them! Thank you for visiting my blog and your wonderful comments! What a great autumn card — love your coloring, as well as all the autumn leaves to embellish with, Tonya. Thank you for the kind words Lillian! Appreciate it! I’m already your blog follower! Thank you for the wonderful comments! I’m happy that you follow my blog!! Cute card! Love he way you colored the cute squirrels! Awe, thanks so much Denise! Appreciate it! Glad I found your blog on this “hop”…love the layering on your delightful card, especially the die cut leaves gathered in the corner. Thanks for sharing! Thank you for the kind words! Much appreciated! These papers are lovely and the perfect complement to these cute images. Your colouring is fantastic on this sweet card. Thanks so much for your kind words!! Appreciate it! What the what?! Could that be any cuter! ?